The French River, named by the Ojibwa after the many French explorers that used the waterway, flows west from Lake Nipissing into the northern part of Georgian Bay. In 1872, all the crown lands along the French River and its tributaries were opened for logging, and by 1875 a sawmill and a small village had been established at the mouth of the river. Samuel Wabb, the first white permanent settler of French River, established a business that served as a store/trading post and a seasonal post office. Though French River’s winter population never exceeded 600 residents, during the summer the population swelled to around 1,500. Besides Wabb’s store, the community had three hotels, two churches, a library, a doctor, and various warehouses and yards to support the lumber industry. 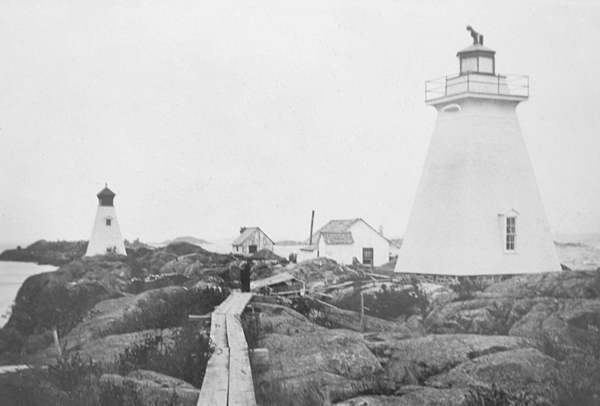 In 1875, an officer of the Department of Marine accompanied by an office of the Department of Public Works surveyed the mouth of the French River and established four temporary lights. 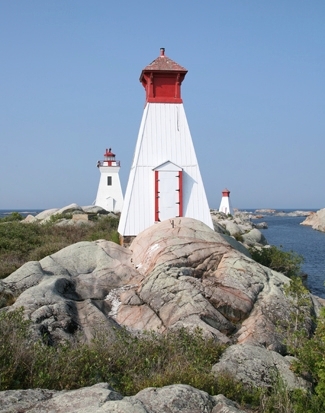 Two outer lights, placed on one of the Bustard Rocks, served as a range to help mariners reach the mouth of the river, and two inner lights, one on Lefroy Island and the other 4,600 feet away in the village, led vessels up the river to the wharf at French River. The four towers consisted of trellis work topped by a wooden lantern and stood between fifteen and twenty-seven feet tall. The rear light on Bustard Rocks used three mammoth flat-wick lamps and three sixteen-inch reflectors and had four panes of glass in its lantern room so the light could be seen from all directions, while its companion front light had just one pane of glass to display the light from a sun-burner lamp along the range line. The front light at French River had two panes of glass and employed a sun-burner lamp to display a fixed white up and down the river, while the rear light had just one pane of glass and used a sun-burner lamp to shine a light downriver. The front tower on Bustard Rocks was painted red, while the other three were whitewashed. Edward Borron, Jr. was appointed keeper of the four lights at an annual salary of $500, and he placed the lights in operation for the first time on September 25, 1875. Keeper Borron lived at French River and personally kept the French River Range, but he hired an assistant to keep the lights on Bustard Rocks, where a dwelling was provided. 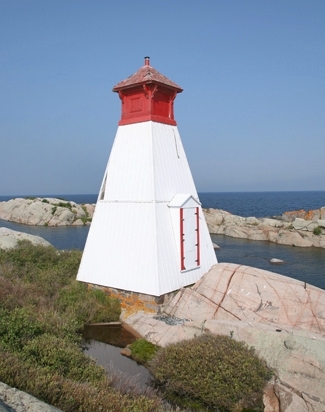 In 1878, Darius Smith, the Superintendent of Lighthouses above Montreal, noted that the dwelling on Bustard Rocks required lining, as the building was very open from the lumber shrinking and thus quite cold for the keeper in the fall. (1) Bustard Rocks main light. The main lighthouse on the Bustard Rocks, which in addition to being a range light, is also used as a lake coast light, has been replaced by a new tower built 20 feet north-east 1/4 east from the old one. The new building is a square wooden tower, painted white, surmounted by a hexagonal iron lantern painted red. The height of the tower from its base to the vane on the lantern is 37 feet. The light is as heretofore fixed white. It is elevated 48 feet above the level of the bay, and should be visible 12 miles from all points of approach, except over the dangerous rocks and shoals to the north-eastward and eastward. The illuminating apparatus is dioptric of the 7th order. (2) Bustard Rocks, front light of inner range. The front range lighthouse on the Bustard rocks, has been replaced by a new tower built near the site of the old one, 229 feet N.E. 1/4 E. from the main light building. 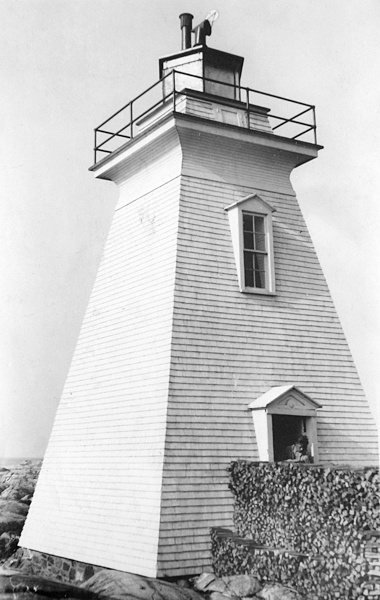 It is a square wooden tower, painted white, surmounted by a square wooden lantern, painted red, and is 28 feet high from its base to the vane on the lantern. The light is as heretofore fixed white, catoptric, elevated 39 feet above the water, and is visible six miles in and over a small arc on each side of the line of range. The above described two lights in range lead in, from a point just clear of the north Bustard Rock, to the intersection of this range with the French River range. (3) Bustard Rocks, front light of outer range (new light). An additional range lighthouse has been erected on the Bustard Rocks, 193 feet W. by S. from the main tower. The building is a square wooden tower painted white, surmounted by a square wooden lantern, painted red, and is 28 feet high from the base to the vane on the lantern. The light which was put in operation on the 16th October last, is fixed white, catoptric, elevated 27 feet above the level of the bay, and should be visible 10 miles in and over a small arc on each side of the line of range. This light, in one with the light in the main tower, leads in E. by N. from deep water clear of Isabel Rock on the north, and of all the shoals south-west of Bustard Rocks on the south. (4) French River back range light. The back range tower of the French River range has been replaced by a new tower built in the village 340 feet back, or N. E. by N., from the old tower. This change of site was found to be desirable because the tower in its former position was hidden by lumber piles and consequently could not be utilized as a day beacon. 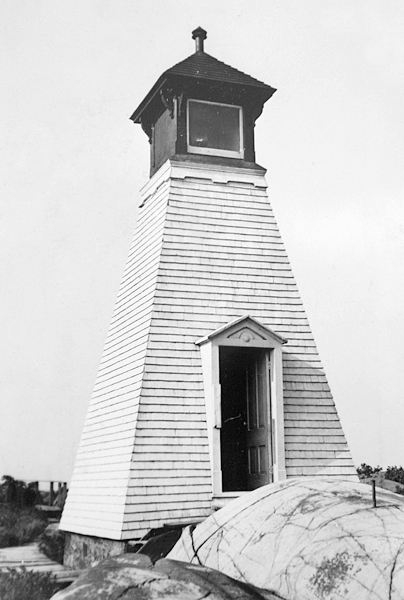 The new tower is a square wooden building, painted white, surmounted by a square wooden lantern painted red, and is 33 feet high from its base to the vane on the lantern. The light is, as heretofore, fixed red, catoptric, and should be visible six miles in and over a small arc on each side of the line of range. It is elevated 37 feet above the level of the bay. The French River range leads in, as heretofore, from its intersection with the inner Bustard range to Lefroy Island, clear of all obstructions. 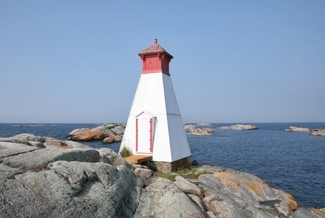 The characteristic of the French River Front Range Light was changed in 1900 from fixed white to fixed red so it could be distinguished from the bright electric lights at the mills. 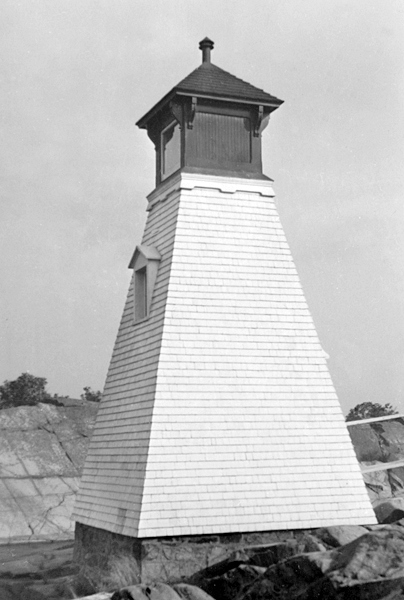 In 1914, a new tower, in the form of an square, open-framework tower, with sloping sides covered with slats and topped by a square lantern, was built for the French River Front Range Light. I write to you regarding the matter of the Bustard Islands. I must inform you that I have been Assistant Keeper there for three years and so far have not been paid for the last year. In addition Mrs. Borron has only been out thrice in the last five months. At her last visit she made me give her matches and some oil. I have a family and wife and we are starving. I believe she is cheating the dept. The Department decided to separate the responsibility for the range lights and placed Thomas Ullman in charge of the Bustard Rocks ranges effective March 1918, while Emma Borron remained in charge of the range at French River. Well, we were picked up on Dec. 9 to go to mainland for winter. That night it got dark and foggie and raining. Could not see the range lights and so ran the steamer on the Burton Rocks, N.W. of Byng Inlet. At 9 we took to the lifeboats and got off all right – a little wet but no suffering. We laid on the floor in the light-house 3 nights with 22 of a crew. 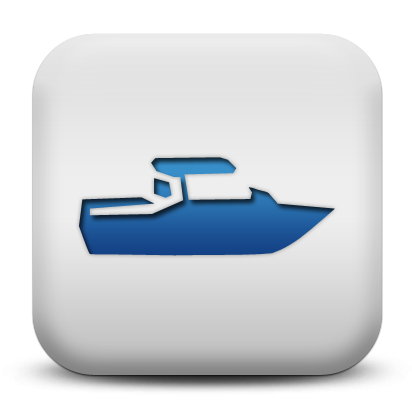 My little motor-boat and all our clothing and bedding and all we own was lost. The steamer will remain on the rocks all winter as the wrecking crew cannot get her off. Keeper Mountnay certainly didn’t need a lesson of how useful range lights could be, but he got one he would never forget that December. Tom Flynn took care of the lights on Bustard Rocks after Keeper Mountnay and served until the lights were electrified in 1951. Flynn was known for coining colourful phrases like “holy jumping Nellie,” “the hootenanny off the galloping rod,” and “wouldn’t that make you jump up and grab your eyelashes.” When his superiors requested that he activate the lights earlier than usual in 1930, Flynn didn’t know how he’d reach them short of trekking through snow “up to his armpits” and wading through swamp water so thick you “couldn’t drive a squirrel through with a blacksnake whip,” but a local pilot solved the problem by delivering Flynn to the lights in his snowplane. Though he enjoyed his job enough to spend twenty-four years on Bustard Rocks, Keeper Flynn said he often felt like a lion pacing back and forth in his cage. Reginald McIntosh, a local fishermen, looked after the battery-operated lights from 1951 to 1953, when Coast Guard personnel took over the job. The two shorter towers on Bustard Rocks were deactivated in 1999, but the main light is still active, sending out a white flash every ten seconds. The keeper’s dwelling on Bustard Rocks was removed in 1965 by Jim and Gordon McIntosh of French River. Head Keepers: Edward B. Borron, Jr. (1875 – 1902), Emma B. Borron (1903 – 1918), Thomas Ullman (1918), David Mountnay (1919 – 1928), Thomas W. Flynn (1928 – 1951), Reginald McIntosh (1951 – 1953). Alone in the Night, Lighthouses of Georgian Bay, Manitoulin Island and the North Channel, 2003. Great Lakes Lighthouses Encyclopedia, Larry & Patricia Wright, 2006. Located on Bustard Rocks, part of French River Provincial Park. For a larger map of Bustard Rocks Range Lighthouse, click the lighthouse in the above map. Bustard Rock Range Lighthouses are best seen by boat. I stayed at Campe Dore and visited the lights with their water taxi service. The range lights are owned by the Canadian Coast Guard. Grounds open, tower closed.